Part two of our top wedding trends 2016 covers chic copper details, stunning stationery, cute cake toppers and some of the most beautiful wedding dress trends you’re bound to see all year! 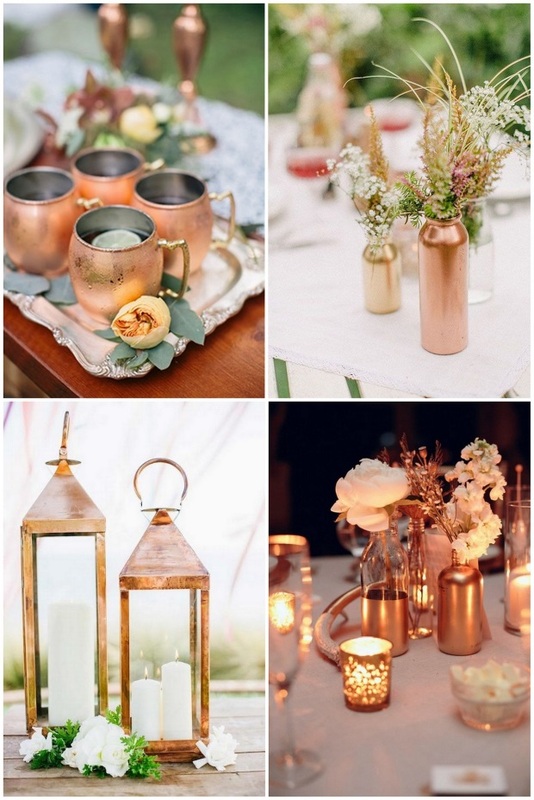 Metallics will be huge again in wedding decor this year and one metallic in particular we think we’ll be seeing more of is gorgeous copper. Copper has become a huge trend in kitchenware lately but it’s not just the table decor that will be getting a touch of bling; stationery, shoes… brides will be adding this muted metallic throughout their wedding to give it an elegant and modern feel. 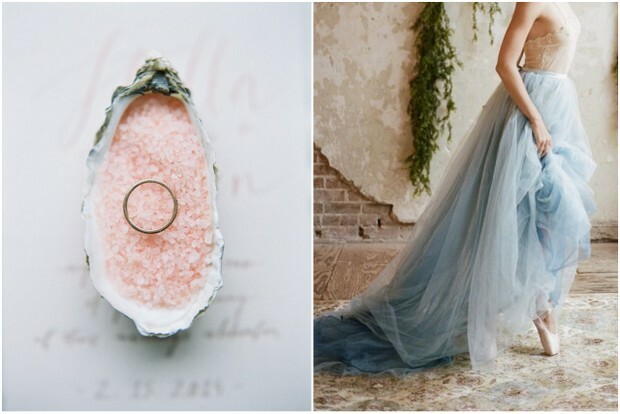 The Pantone colours of the year will no doubt be making an appearance in wedding themes throughout 2016. Rose Quartz and Serenity Blue may sound a little fancy but what we’re basically talking about is baby blue and pink. This rose pink is an easy peasy colour to base your wedding on and you’ll find it just about everywhere from stationery to decor to dresses. Blue on the other hand can be a bit trickier to pull off and many will try it with bridesmaids dresses but approach with caution and make sure it really suits your girls’ skin tones before you buy! The back was getting all the attention in 2014/15 but alas we’ve moved on. Not by much though! Instead of heading down the daring route of dangerously low backs, designers are opting instead to decorate their gowns with stunning sparkling neck and shoulder details. From Justin Alexander to Pronovias, Marchesa to Queen-of-the-wedding-dress-bling Anna Campbell, we’re seeing some gorgeous details emerging. Those opting to go strapless can get in on the action too – gorgeous shoulder jewellery and beaded boleros are becoming hugely popular for brides looking for some extra bling on their day. Look to Etsy and Power Blue Bijoux for gorgeous shoulder jewellery and designers like Hayley Paige for beautiful beaded boleros and accessories. 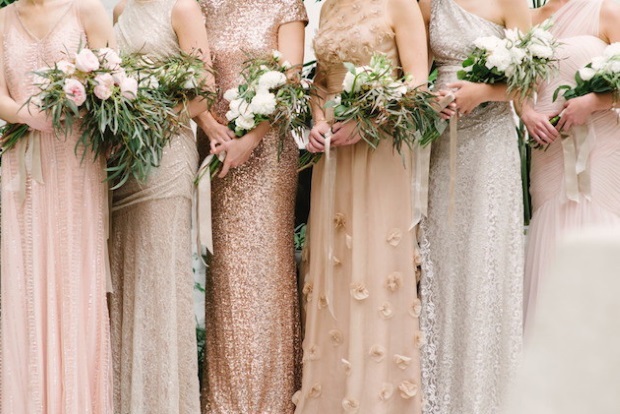 Another wedding dress trend that has been gaining in popularity over the years is separates. Separates are great for brides hoping to create a truly unique look that reflects their own modern style. More and more designers are adding fabulous pieces to their collection as a result – check out Charlie Brear’s tiered skirts and slip tops, the pretty tea length tulles and crew neck sweaters at Jenny Yoo and you’ll see how for 2016 gorgeous wedding dress separates are taking up where the one piece has left off. Wedding invites can be a really difficult thing to choose, after all they are the first thing your guests will see of your wedding and often can set the tone of the day. This may be why the trend this year is to go towards a more minimalist look overall where font is the design feature. 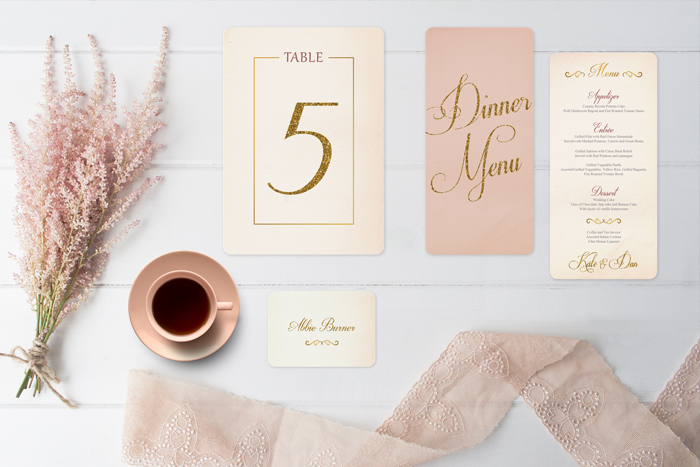 Whether it’s ultra modern or romantic calligraphy, a beautiful font can be the perfect design for any invite – we love Kerry Harvey’s All that Glitters suite which pairs a beautiful gold glitter calligraphy font with romantic blush tones. Another place we’ll be seeing font as a feature is on cakes! Cake toppers have come a long way in recent years and can be traditional, humorous, elegant and sometimes admittedly very twee. 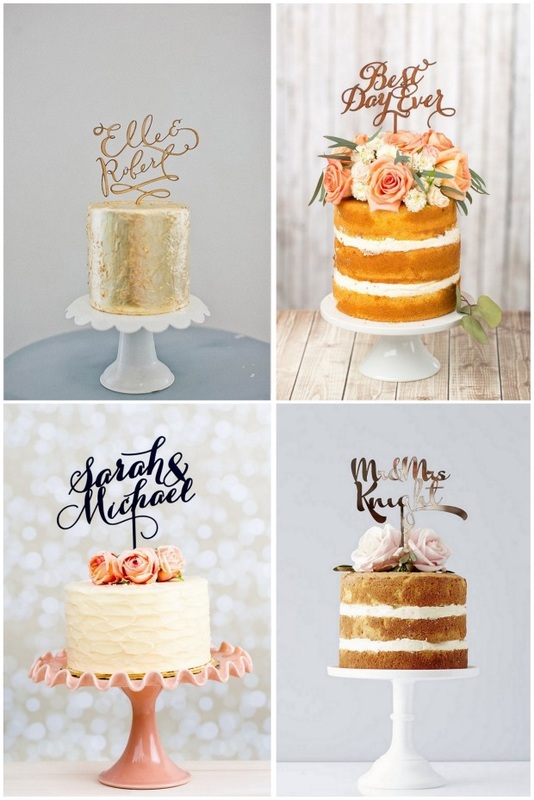 The calligraphy cake topper is a trend we can really get on board with, looking super modern and bringing in the metallic look that’s also hugely popular this year. It’s also a lovely way to add some personal words and makes a great keepsake! Check Etsy and Not on the High Street for personalised script toppers, or make your own with this great DIY project! It’s fair to say that engagement rings are becoming more and more unusual as brides and grooms are searching far and wide for something really unique that suits their personal style. Vintage style rings are one of the biggest trends in settings this year, with couples opting for rose gold and more detailed features than ever before. 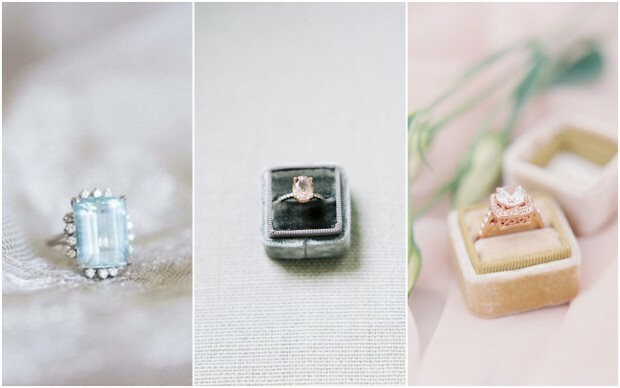 For the main feature, many brides-to-be are mixing it up with colour gemstones – pink morganite, green emerald and tourmaline, ruby garnet – and creating something truly different. Neck and shoulder jewellery and the copper elements are so amazing.